Magnets are materials that produce magnetic fields, which attract specific metals. Every magnet has a north and a south pole. Opposite poles attract, while like poles repel. While most magnets are made from metals and metal alloys, scientists have devised ways to create magnets from composite materials, such as magnetic polymers. Magnetism in metals is created by the uneven distribution of electrons in atoms of certain metal elements. The irregular rotation and movement caused by this uneven distribution of electrons shift the charge inside the atom back and forth, creating magnetic dipoles. When magnetic dipoles align they create a magnetic domain, a localized magnetic area that has a north and a south pole. In unmagnetized materials, magnetic domains face in different directions, canceling each other out. Whereas in magnetized materials, most of these domains are aligned, pointing in the same direction, which creates a magnetic field. The more domains that align together the stronger the magnetic force. Permanent magnets (also known as hard magnets) are those that constantly producing a magnetic field. This magnetic field is caused by ferromagnetism and is the strongest form of magnetism. Temporary magnets (also known as soft magnets) are magnetic only while in the presence of a magnetic field. Electromagnets require an electric current to run through their coil wires in order to produce a magnetic field. Greek, Indian, and Chinese writers documented basic knowledge about magnetism more than 2000 years ago. Most of this understanding was based on observing the effect of lodestone (a naturally occurring magnetic iron mineral) on iron. Early research on magnetism was conducted as early as the 16th century, however, the development of modern high strength magnets did not occur until the 20th century. Prior to 1940, permanent magnets were used in only basic applications, such as compasses and electrical generators called magnetos. The development of aluminum-nickel-cobalt (Alnico) magnets allowed permanent magnets to replace electromagnets in motors, generators, and loudspeakers. 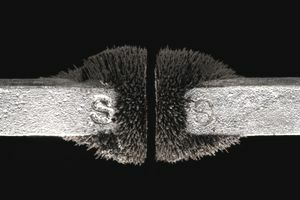 The creation of samarium-cobalt (SmCo) magnets in the 1970s produced magnets with twice as much magnetic energy density as any previously available magnet. By the early 1980s, further research into the magnetic properties of rare earth elements led to the discovery of neodymium-iron-boron (NdFeB) magnets, which led to a doubling of the magnetic energy over SmCo magnets. Rare earth magnets are now used in everything from wristwatches and iPads to hybrid vehicle motors and wind turbine generators. Metals and other materials have different magnetic phases, depending on the temperature of the environment in which they are located. As a result, a metal may exhibit more than one form of magnetism. Iron, for example, loses its magnetism, becoming paramagnetic, when heated above 1418°F (770°C). The temperature at which a metal loses magnetic force is called its Curie temperature. Iron, cobalt, and nickel are the only elements that — in metal form — have Curie temperatures above room temperature. As such, all magnetic materials must contain one of these elements.